Kelly Said 'No' To Dieting - Then Dropped Three Dress Sizes! A Chesterfield slimmer who transformed her life by dropping 3 dress sizes is using her success to shape a whole new career helping other people change their lives and achieve their weight loss dreams too. Kelly decided to join Slimming World after she could no longer fit into her size 18 clothes! "I wasn't going shopping unless it was for clothes a size smaller. So I made the decision to join Slimming World. "I was excited, but very nervous. Literally having tried every fad diet under the sun - with little or no results! I was very apprehensive. I needn't have worried" said Kelly. "As soon as Gail, the consultant, came over, she put me at ease. She went through everything and I couldn't believe how much you could eat - in fact I had to double check it was right!" Kelly fell in love instantly with the plan, "There was no portion control involved. I was able to eat as much as I liked of the healthy free foods and I could still enjoy a treat like chips, chocolate or a glass of wine." 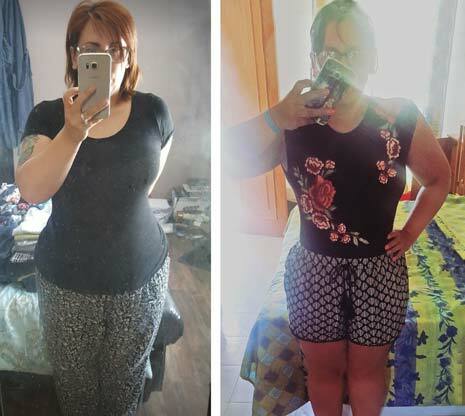 17 months on and Kelly is still loving her journey, "I love eating the meals and cooking the recipes, my favourite is BBQ pulled pork with lots of speedy salad and slimming world chips." Kelly has lost over two stone in total and gone from a size 18 to a size 12! "I feel great I have loads more energy. I am able to run around with my three boys. We go out walking and bike riding and I go to the gym with my partner Paul. The whole family are more active and I couldn't have done all of this before joining Slimming World." The support Kelly has received has been the key to her success. "I couldn't have lost my weight without the weekly help, encouragement and understanding from my own Consultant and group. They have become my 2nd family and have supported me through some tough times. Gail is always on the other end of the phone if I need advice or support. "When I first joined Slimming World as a member, I never dreamed that I would end up helping other people to lose weight - but now I just can't wait to get started. After completing my training, it's a privilege for me to be able to pass on the experience, insight and understanding that helped me, so that I can give my members the support they need to get to target." Kelly will be opening a new group at Grassmoor Community Centre on Thursday 29th December at 7:30pm. For further details, please contact Kelly on 07863 651707.